Not that there was any doubt that The Mountain from Game of Thrones is skull-crushingly strong, but now it's official: Hafthor Bjornsson, the actor who played the big and burly character of Gregor Clegane on the HBO mega-hit series, is literally the World's Strongest Man in real life. He earned the title after winning the international competition of the same name over the weekend. 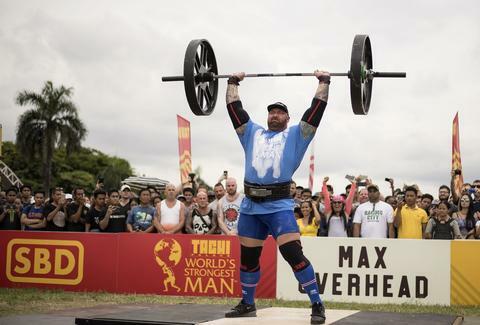 The 6-foot-9, 397-pound Icelandic athlete and actor took part in the 2018 World's Strongest Man competition for the seventh consecutive time over the weekend, and nabbed the top spot for the first time after dominating in three of the final six events. He's also the first athlete to win the World's Strongest Man, Europe's Strongest Man, and the Arnold Strongman Classic competitions in the same calendar year. In other words, you probably shouldn't challenge him in arm wrestling if you enjoy having all of your limbs intact. The 29-year-old muscle man ended up on the top of the podium after an impressive performance that included a 20-ton truck pull, a loading race that required packing five 360-pound objects onto one platform, and the final Atlas Stones event, where competitors are tasked with hoisting five insanely heavy stones onto designated stands. He beat out Poland's Mateusz Kieliszkowski and American Brian Shaw, who took second and third place, respectively. And while he may have played an exceptionally evil villain on GoT, Björnsson seems like a wonderfully good sport with a great attitude and all-around friendly, taking to Instagram to thank his family, friends, fans, and coaches, as well as congratulate his fellow competitors on a job well done. Still, he could probably rip everyone reading this in half if he wanted to.